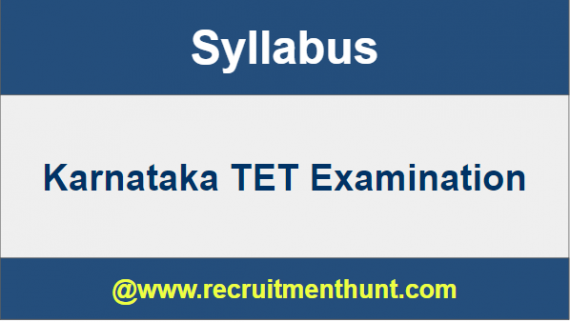 Karnataka TET Syllabus: Recently School Education Department of Karnataka has released the Karnataka TET Recruitment Notification 2019. Many Candidates who are interested have applied for this Karnataka TET Recruitment 2019. Now, It is the time to start the preparation to get succeed in the Karnataka TET Examination. Candidates can get Karnataka TET Syllabus here in the following sessions. Here, we also provide Karnataka TET Exam Pattern 2019 and Aspirants can download Karnataka TET Syllabus and Karnataka TET Exam Pattern 2019. Candidates can start their preparation by using Karnataka TET Syllabus , Exam Pattern and Previous Year Solved Question Papers here in the below sections. Candidates can utilize all the required information for their preparations. Karnataka TET Exam is conducted to recruit the various number of Teachers in Karnataka State. Aspirants in Karnataka can grab this opportunity by preparing well for this Karnataka TET Competitive Exam. Candidates have to succeed many contenders to get this Karnataka TET job. Because many contenders have applied for this KARTET Recruitment 2019 and preparing for the Karnataka TET Exam. Here, in this page, we will provide the complete Karnataka TET Exam syllabus with free of cost and Aspirants can download Karnataka TET Exam Syllabus and Karnataka TET Exam Pattern 2019 by clicking on the links provided below. So, Candidates are advised to cover all the important topics by checking the KARTET Exam Syllabus here. Karnataka Teacher Eligibility Test written test is conducted in two phases i.e Paper I and Paper II. Here, we will provide Karnataka TET Exam Paper 1 and Karnataka TET Exam Paper 2 syllabus and Karnataka TET Exam Patterns in the following sessions. Firstly Karnataka TET Paper 1 is for the teachers of class 1 to Class 5 and KARTET Paper 2 Exam is for the Teachers of Class 6 to Class 8. All the applicants who are searching for Karnataka TET Syllabus can check complete information here. Before going for the KARTET Exam Contenders have to prepare well to crack the Karnataka TET Exam. So, Candidates can check Karnataka TET Syllabus and Karnataka TET Exam Pattern 2019 here. Karnataka TET Paper 1 Exam consists 150 multiple choice Questions. Exam Duration for KARTET Paper 1 Exam is 2 hours 30 minutes. Karnataka TET Exam Paper II has these disciplines Child Development And Pedagogy, Language-I (Kannada), Language- II (English), Mathematics & Science and Social Studies/Social Science. Total Time Duration for KARTET Recruitment Paper 2 is 2 Hours 30 Minutes. Finally, Candidates can download Karnataka TET Syllabus Previous Papers here. So, Applicants can make their preparation easier by following Karnataka TET Syllabus. Download Karnataka TET Patterns along with Karnataka TET Previous Paper on this article. Also, For more Job Updates stay Tuned to our site Recruitment Hunt. Also, for more Sarkari Naukri updates, please visit Recruitment Hunt.